I think it is very interesting to get students to choose their own numbers and talk about how they might solve the problem based on those numbers. I have done it here with fractions. So students get to decide: 1) if they are going to do it in their head 2) if they are going to use a model 3) if they are going to use a written method. This type of thinking can be so powerful! I am very excited about this book. This is just what we needed. Everyone is constantly concerned about their upcoming state assessments and how to prepare students for them. This book is part of the answer. Test-Savvy Math gives a long-term strategic solution to an ever present dilemma. Through academically rigorous games and ongoing standards based routines, students get “test savvy” all year long. 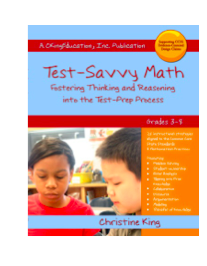 Look at the interview that I conducted with Christine King, the author of Test-Savvy Math. The book can be purchased on Amazon.com and Christine is currently offering a PD special deal to my subscribers. Click here for more details.